Loonies and Drunks: "American Psycho" and "28 Days"
Do you know what movie I was reminded of during American Psycho? The Bridges of Madison County. Not that the two really have anything in common, but American Psycho, like Bridges, also started out as a critically-reviled novel - probably the most universally loathed one of the past few decades - and ended up as a thoughtful, sharp, and wholly entertaining film. And in both cases, the lion's share of credit must go to the director and screenwriter (in this case, director Mary Harron and her co-screenwriter Guinevere Turner), who have thrown out a lot of the previously-published material in favor of something... well... better. Clint Eastwood and screenwriter Richard LaGravenese took out a lot of the florid, romantic verbiage in Bridges and turned it into something real, and Harron and Turner have gone the opposite route - taking material that was presented by author Bret Easton Ellis as true-to-'80s-life and turning it into something stylized and satirical. Despite a few glitches, it works terrifically well, and is probably the only route this particular film could have taken to succeed. The movie is marvelously vague (which, along with the novel's heinous reputation, will probably keep it from being a hit). Here's what we know: Patrick Bateman (Christian Bale) is a 27-year-old Wall Street hotshot in the late 1980's, obsessed with the finery of his lifestyle: the rich fiancee (Reese Witherspoon), the neurotic mistress (Samantha Mathis), the clothes, the food, the exercise regimen. But he's clearly a vacuum - swimming in luxury, but empty inside. His true self emerges (and here's where things become iffy) with his hobby - the meaningless slaughter of innocent bystanders, dates, and people who irk him, all on a semi-regular basis, and all with a grotesque range of weapons: axes, nail guns, and chainsaws, for starters. Ellis' novel went into grisly detail when it came to the murders, but Harron stages the killings impeccably, with very little actual violence shown. And apart from her good taste, there's a reason for that - we're never sure if the murders are actually happening. In the first few minutes of the film, Bateman viciously turns on a bartender who he believes is overcharging him, haranguing her and threatening to kill her; the bartender has her back turned, though, and never responds. All we see is Bateman's ranting in the bar mirror, and Harron's and Turner's methodology becomes clear - we're free to read American Psycho as Bateman's pathetic, misogynist view of himself, and the threats and killings as his twisted fantasy life. Harron and Turner pull off neat little tricks like this throughout the movie; at the end, you can convince yourself that events either did or didn't occur, and it makes sense either way. That's not to say, if you take the whole film as the blackest of black comedies, that Harron doesn't supply her share of suspenseful moments, too. There's a segment with Bateman trying to find the best way to off his secretary that's positively nerve-racking (it helps that the secretary is Chloë Sevigny, a charming specialist in deft underplaying), and his scenes with an investigator played by the brilliant Willem Dafoe are both highly comic and surprisingly chilling - they're reminiscent of the Frances McDormand/William H. Macy sparring in Fargo. But the film works best as a bright, witty parody of '80s materialism and excess; the scenes with Bateman and his fellow Masters of the Universe ogling each other's business cards, trying desperately to get reservations at the latest chi-chi eatery, or confusing each other's identities (as human beings, they're interchangeable) are priceless bits of satire, which Harron pulls off without a whiff of self-congratulation. Best of all, the movie has Christian Bale, who gives a high-comic performance equal to that of, say, Jeremy Irons in Reversal of Fortune. Sporting a pitch-perfect American accent (the actor is Welsh), everything Bale does is stylized and funny and sinister all at once; he's never more magnetic than when rambling on about the joys of Huey Lewis & the News while drenched in the blood of his latest victim. And everything he does clues us in to how Bateman is unraveling; his facial tics and vocal timbre show a man desperately trying not to lose it, and when he does lose it, Bale delivers a grand, almost cathartic performance. American Psycho isn't seamless - about two-thirds of the way in, the action and character revelation start to become monotonous (it's obvious that the only thing that can happen is Bateman's eventual crack-up), and, unfortunately, Witherspoon and Mathis are left with nothing to do and are quickly dropped from the movie. However, it's a first-rate film nonetheless, with moments of sheer brilliance. Mary Harron and her topnotch crew have created something pretty wonderful out of something pretty repugnant, which, in these moviemaking times, is something borderline miraculous. 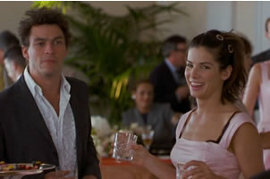 28 Days, the Sandra Bullock vehicle about a "lovable" drunk going through rehabiliation, must have really caught me off guard, because I didn't hate it at all. Truth be told, nothing could have interested me less than the prospect of viewing the "wacky" antics at a detox clinic starring the ever-game Bullock; I had recently sat through the annoyances of Girl, Interrupted, which this film often closely resembles, and Bullock hasn't impressed me since While You Were Sleeping back in 1995. But the movie isn't bad. It has a refreshing perspective - Bullock's character sees through the surface silliness of her 12-step groups, but eventually realizes their necessity - and a swift pace; director Betty Thomas never makes the mistake of drowning in the film's inherent sentimentality. And while a lot of the film's comedic moments aren't all that funny, at least they're presented with crispness and professionalism. Girl, Interrupted revealed its clichés as revelatory, which made the film seem pretentious, but 28 Days treats them as a source of humor, and is smart enough to have Bullock giggle at their inanity. This allows her to give a fine performance, throwing off her insults under her breath, and making you feel like you've watched a true arc in a (clichéd) character's life. It's a surprisingly effective portrayal, and she's matched by some real winners in the supporting cast (best of whom is Steve Buscemi in a beautifully low-key role). The movie does veer uncomfortably towards the melodramatic throughout, and it's all as predictable as could be; you're not really missing much if you choose to ignore it. But it's a pleasant, engaging work, an audience-friendly dramatic comedy - like the Julia Roberts smash Erin Brockovich - that you can easily enjoy with only the slightest of reservations.